The organization of the working class against the attacks of the neoliberal governments does not stop in 2017. 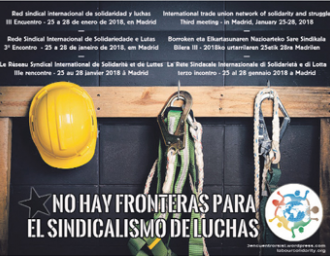 At the beginning of 2018, the internationalist struggle of the CSP-Conlutas gains strength with the 3rd International Meeting of the ILNSS (International Labour Network of Solidarity and Struggles) that will take place on 25 to 28 of January, in Madrid, Spain. Respecting the construction of the Network - founded in 2013, in France - in note of disclosure of the event, it is stressed that, being a "product of years of exchange and joint work between several of the founding organizations", some common points discussed In the last international meeting, which took place in June 2015, in Campinas, São Paulo, they will be resumed so that they can be deepened and put into practice. Issues of the LGBT struggle, against machismo and other forms of oppression will be discussed from the experiences presented from different parts of the world, as well as discussing colonialism, its consequences, migration, repression and self-management. Empowering women to be the representatives. Gender violence and/or sexist violence. LGBT discrimination.